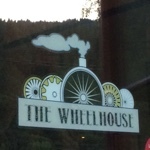 I had heard there was a cafe near the train station that opened at 6 so I wandered around till I found the Wheel House and the sign on the door said, "Open 6-10." I waited, (nothing else to do at that hour) and ended up with a splendid pancake, egg, bacon breakfast. Sourdough pancakes aren't my first choice but they were good, for sourdough pancakes that is. 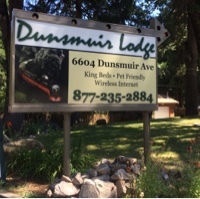 Once fed, I needed to decide if I was going to hit the trail today or get a room at the Dunsmuir Lodge, which is known for their hospitality towards PCT hikers. I also had to find out how to get to the trailhead, which is five miles south of town. There is no road directly there, other than highway 5, so the only choice I have is to walk the railway, which really didn't appeal to me, considering all the train traffic running through this area. By the time I'd walked the mile or so south along the main road through town to the lodge I realized I probably needed sleep more than hiking today. However when I arrived a bit after 7am, the door was locked with no sign of life inside. I hated to do it but I pushed the button saying "push for service" and rousted out Eric, who had been asleep. Eric, who is owner and sole proprietor, did find me a single bed that I could get right away, which I really needed if I was to catch up on my sleep. He also offered to take me to the trailhead early tomorrow morning for the cost of gas. Yea! Two birds, one stone! After a brief lay down I walked back to town to mail a book back home and snag some lunch. I took a meandering route, looking in thrift stores and collectable haunts, trying to get a feel for this town. What I learned is that there are 21 creeks running underneath the town proper and that water is abundant. 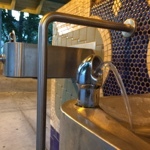 Which is why the public water faucets, which I assumed were broken, are actually on all the time. Something that is very hard for me to look at without trying to fix them somehow. 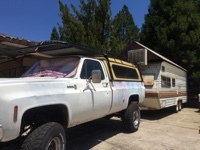 Also, some folks being creative about fashioning a mobile snow capable trailer. At least, I think that's what they were after. I finally staggered back to the lodge in the afternoon heat, measuring around 93 or thereabouts, and fell onto the soft bed and into sleep. It's now close to five but still blistering hot. Time to wander back to town and rustle up dinner before gathering my stuff, ready to hit it tomorrow, as early as I can con Eric into dropping me off at the trailhead. This kind of heat worries me but I'll just walk in the early hours and after it cools down in the evening, with long breaks mid day. It'll all be good. Dinner done, the is heat radiating off the asphalt and my plans for tomorrow morning are solidified. Now? I am off to snooze landia. I will check in next when the electronic gods are willing.